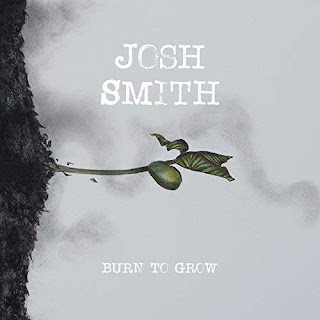 I just had the opportunity to review the most recent release, Burn To Grow, from Josh Smith and it's really cool. Opening with soul flavored track, Half Blues, the title hits it. This track has strong soulful vocals and a solid blues bottom with stinging guitar work by Smith. Backed by Travis Carlton on bass, Lemar Carter on drums Jamelle Adisa on trumpet, Chris Johnson on trombone, J.P. Floyd on trombone, Matthew DeMerritt on tenor sax, and Dan Boisey of tenor and bari sax, this is a terrific start. A bit smoother, a bit like Al Green, Through the Night shows real attention to conventional soul music but still with the guitar accents of a blues master. A strong radio contender with a great melody and warm melodic backing vocals by Monet Owens, Watching You Go has powerful guitar riffs that would make SRV's neck hair stand on end. With it's heavy bass line lead by Carlton and the raw guitar edge by Smith, balanced by confident vocals, a tight rhythm section and cool horn topping Let Me Take Care of You has a real nice groove. Another of my favorite tracks on the release, What We Need is a loose, slow blues with cocky blues guitar riffs. Smiths vocals are really soulful as throughout but this track just hits the spot. Very nice. A little more funk and horn input on You Never Know yields a jazzier side of Smith and his guitar melds to yet another bluesy style. Wrapping the release is title track, Burn to Grow, a blues fused rocker. With a heavy, lumbering bottom and fat, overdriven guitar this is a solid contemporary closer. start my own blog (well, almost...HaHa!) Excellent job. I really enjoyed what you had to say, and more than that, how you presented it.